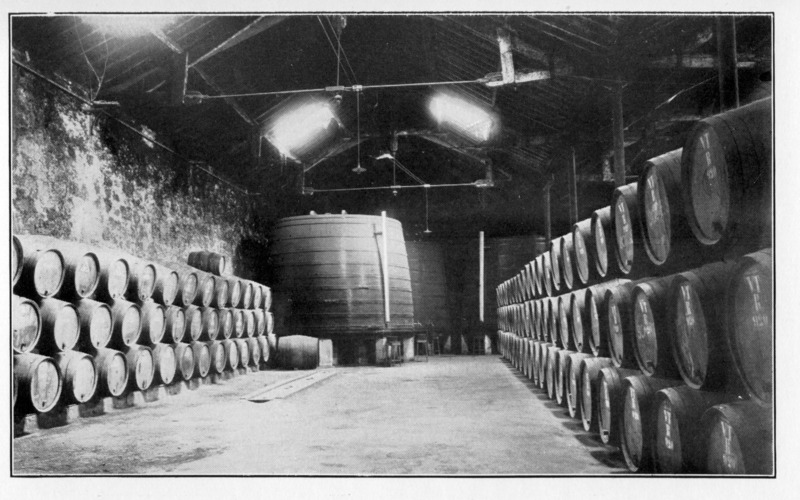 A few of these photos, from William Todd’s ‟Port- How to Buy, Serve, Store, and Drink It” have been posted before but not, to my knowledge as a single group. 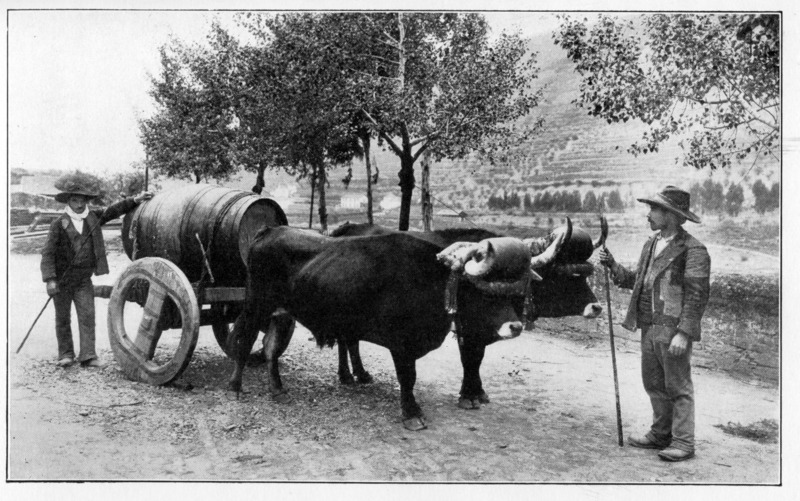 Remember, when looking at the ox-carts, these were taken in 1926! Click on the pictures for larger versions. A Bunch Of Tinta CÃ£o Grapes. 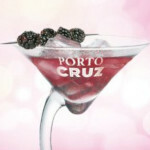 This grape and other fine-quality grapes of the Upper Corgo vineyards such as the Tinta Francisca, Tinta da Barca, Tinta Carvalha, Tourigo, Mourisco and SouzÃ£o, are mixed together, heaped into the wine-presses and blended together by the treading and the subsequent fermentation. It is the judicious assortment of high-quality grapes in the quintas when planting that goes far to make wines of character and distinction when the grapes go to the presses. View of the River Douro at Regoa. The river is fordable in summer at two different places this side of the bridge, and empty bullock-carts can often be seen crossing to avoid the long round by the bridge, and, what is more important, the toll. 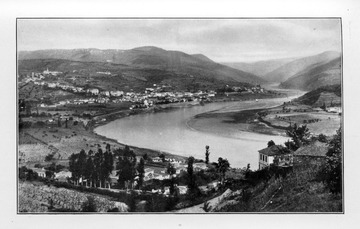 Regoa is on the right bank of the river and is the most important, centre of the Douro wine country. 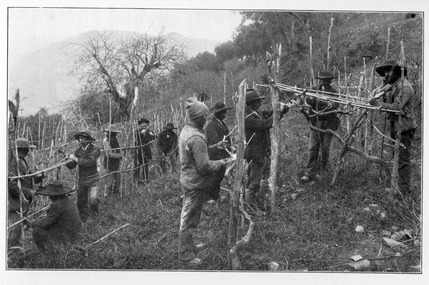 The Government Wine Register Office is at Regoa, where the farmers, after the vintage is completed, must register (about the first week in November) the full amount of wine produced in each quinta, the names of the adegas where the wines are stored and the names of the people to whom sold. Officials from this office go to all the adegas to check the quantities, and no wine can be removed from one adega to another without a permit and no Port Wine from any part of the Douro wine country can go to Villa Nova de Gayo without a certificate being taken out at Regoa. A copy of this is sent to Oporto Custom House to be entered on the shipper’s current account as having come into their lodges, and to be deducted from the same account when shipped over the Oporto Bar. 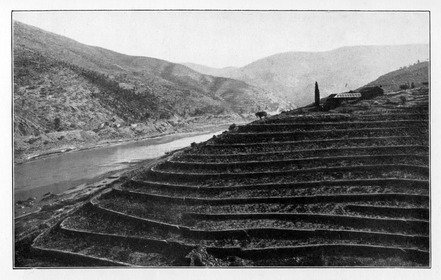 situated on the right bank of the River Douro. 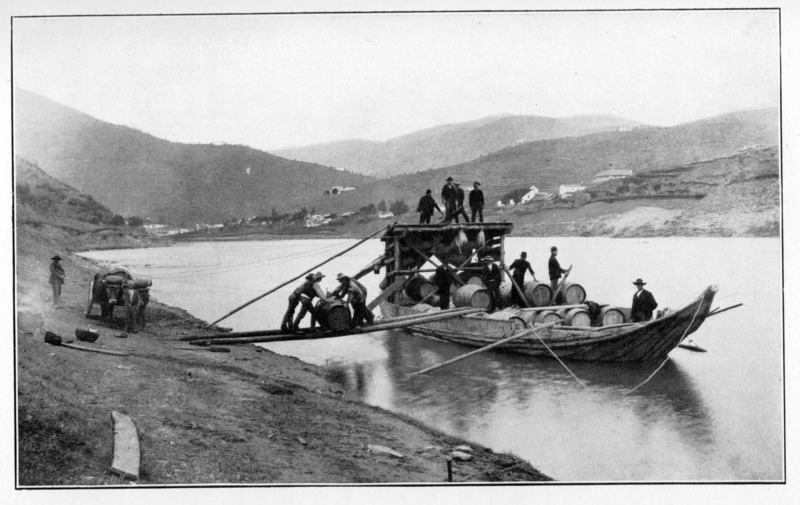 CachÃ£o is a little lower down the river, where a famous shipper, Baron Forrester, a great lighter for Port standards, was drowned nearly a century ago. 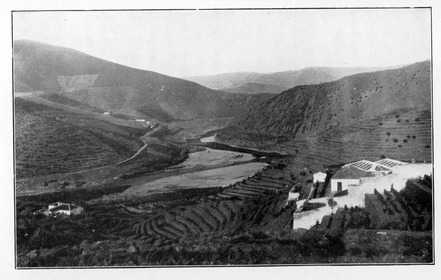 situated on the left bank of the river Douro. This quinta, like many other quintas in the Douro, was completely destroyed by phylloxera and abandoned for over thirty years. 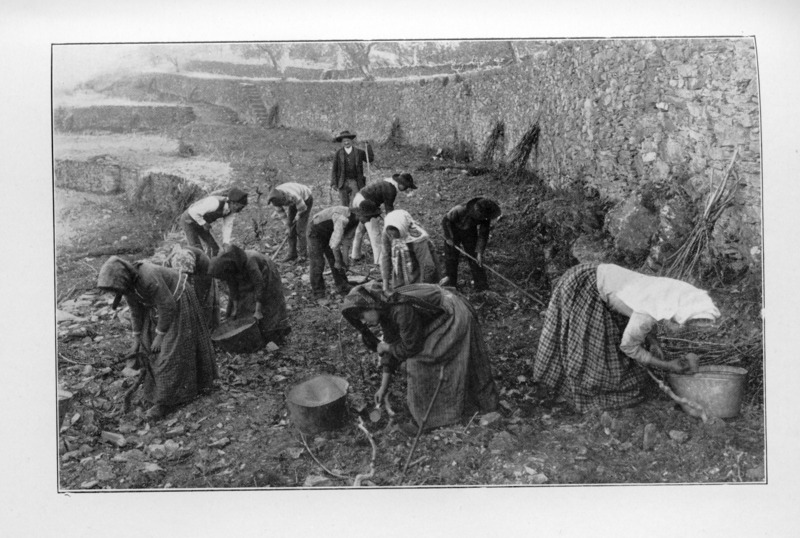 Replanting was begun in a small way at first, but this was pushed on faster later on under new ownership and came into bearing about twelve years ago, and now produces over 200 pipes of wine. 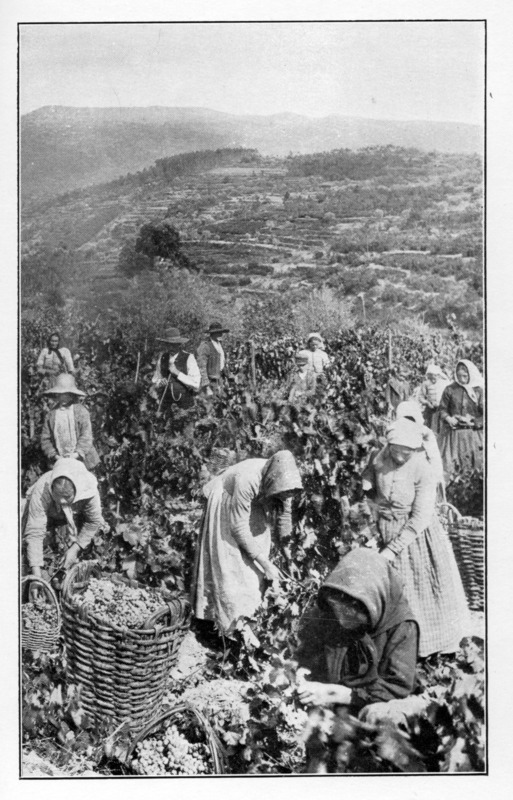 Memories of the phylloxera years are as poignant in the Douro as in France. 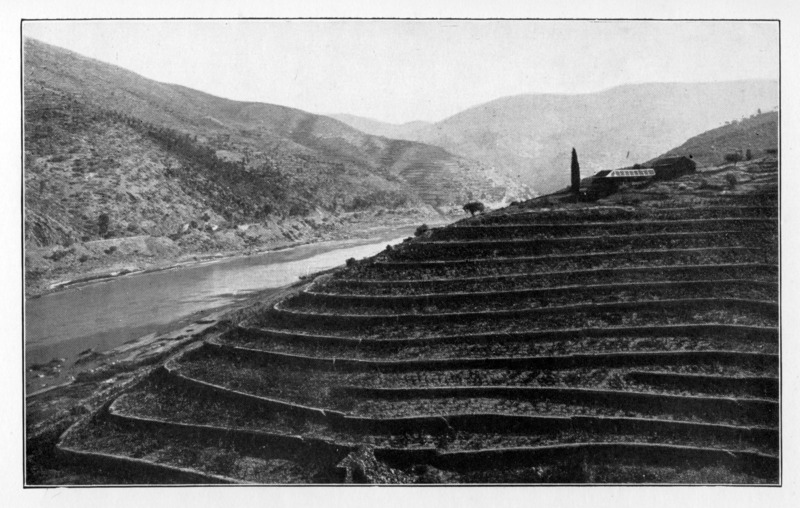 This illustration shows well the character of the terracing of the hill-sides. is often placed in shallow trenches round the vines in winter, that the rains may carry it down to the roots. Chemical or artificial manures are, however, much deprecated by the best farmers, who look more to the fine quality of their wines than to the increased quantity gained by forcing the vines too much. This operation is begun in December after the first frosts have deadened the vines. 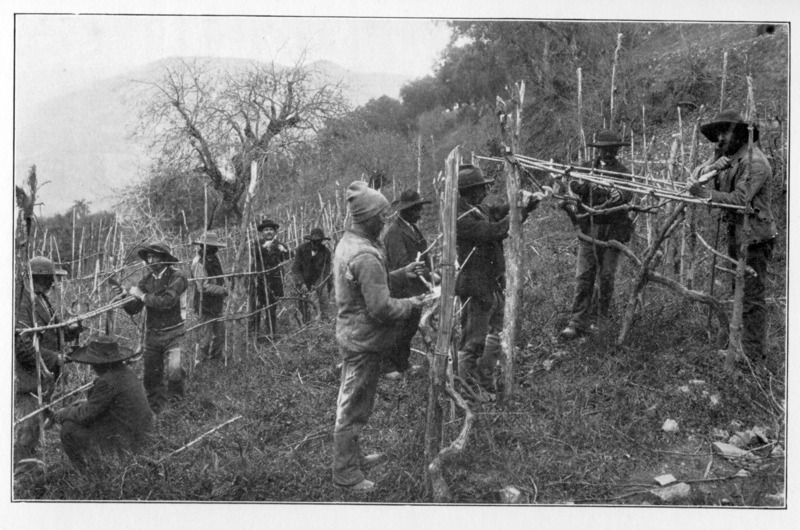 The best and strongest shoots are shortened back to bear, and part of the old wood is cut away to keep the vine shoot close to the ground. Weak and useless shoots are cut off and all old bark removed. In this way the stems are left clean and free from fungus of any sort. This refuse is cleared away at once from the well managed vineyard and burned. Two kilos of sulphate of copper crystals are dissolved in one hundred litres of water, and lime added. This mixture is carefully tested with the Tornuzol Chemical Paper before spraying begins. The treatment usually starts in April, and is repeated three or four times during the early summer, and is a preventative against mildew but of no use as a cure once this has appeared. Mildew is more prevalent in the Lower Corgo, where the soil is heavy and damp. 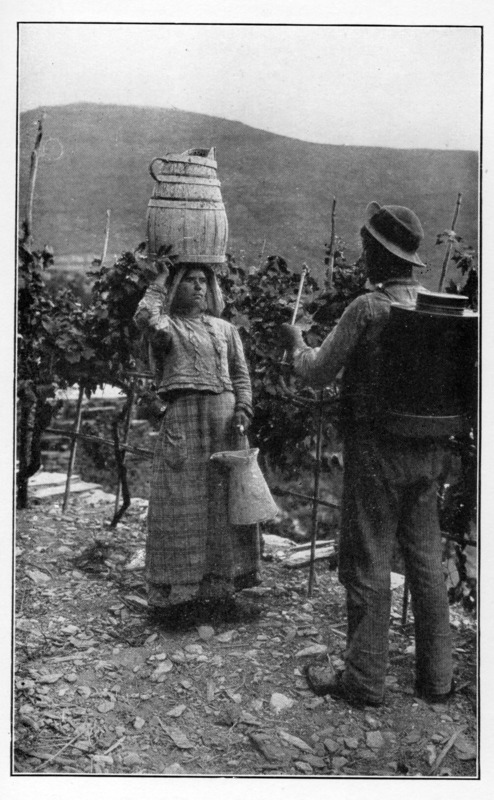 The woman has the liquid in the picturesque wooden bucket. This liquid is poured into the spraying machine, which is closed down tight, and the man, by means of a handle attached to a machine, pumps air into the machine, which forces out a very fine spray, and this he plays on to the leaves and grapes. 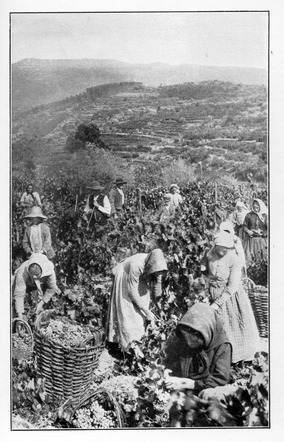 The Vintage or Gathering of the Grapes. 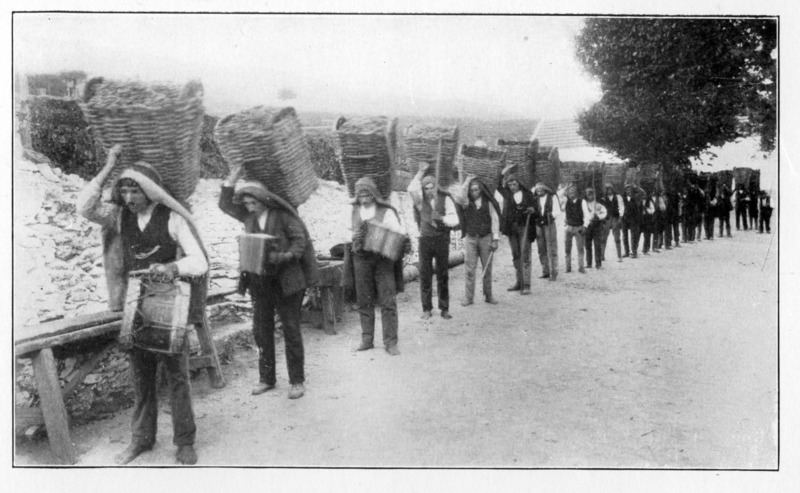 passed from the small to the large baskets, which are then carried by men to the adega and passed through a machine to separate the grapes from the stalks. 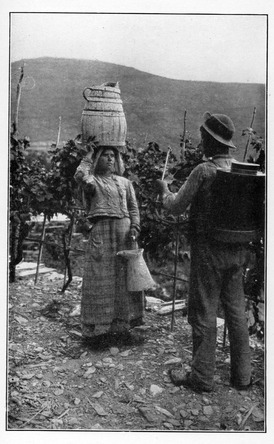 The grapes pass through the machine and drop into the wine press. 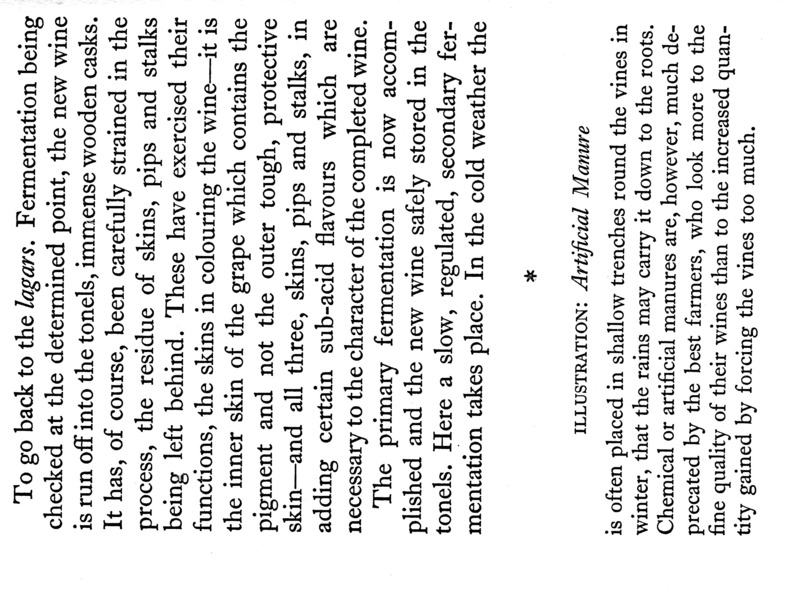 It is found that the character of the wine is improved if a small proportion of the stalks is allowed to remain. Men carrying grapes from the quinta to the adegas, where a separate house contains the wine presses. These stone presses are built at a higher elevation than the vats, so that the must, when ready, is run off in iron tubes to the vats, A large quinta employs sixty women and girls to gather the grapes and twenty to thirty men to carry the large baskets, which each weigh 140 lb. when filled. Fifteen baskets full give one pipe of wine. 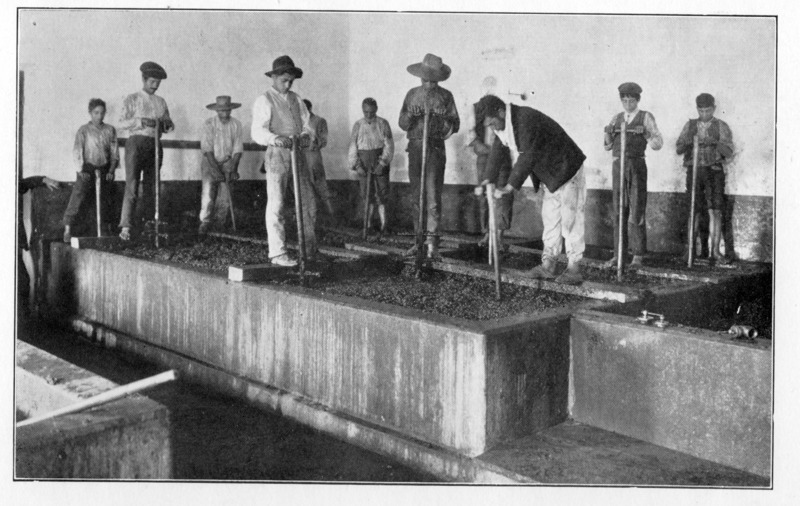 The men are at this work all day long, often in scorching heat, and at night join the men in the presses to to assist at ‘treading’ the grapes until midnight. 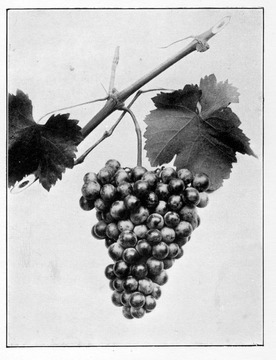 The vintage in all its phases lasts three or four weeks. The wine press is a large stone tank, and usually of sufficient dimensions to hold grapes to make fifteen to twenty pipes of wine. 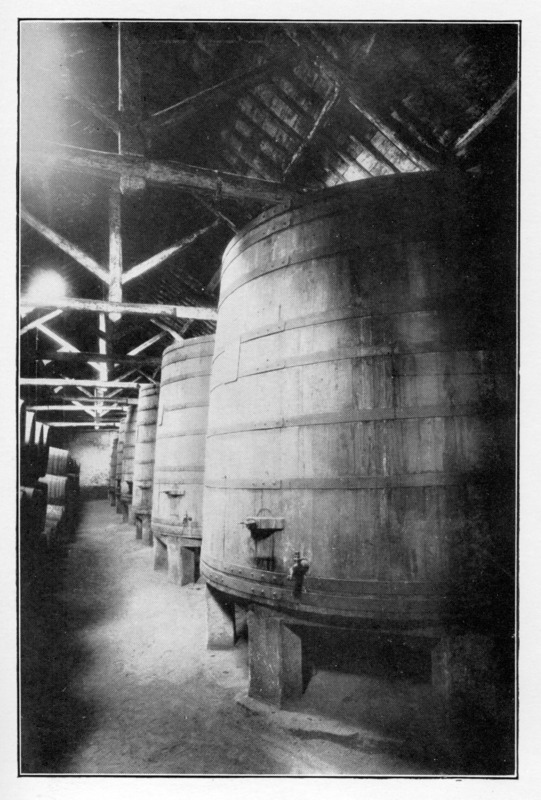 Forty men tread the grapes for twenty-four hours; afterwards the fermentation is evenly maintained by the use of churning sticks to keep the liquid in constant motion until the desired degree of fermentation is obtained. This is run off into vats, brandy is added to prevent any further fermentation and not to lose the sweetness. 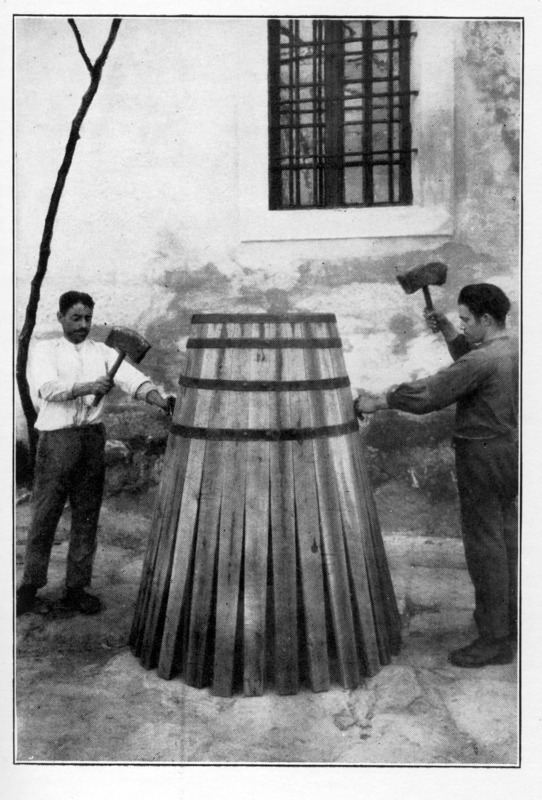 Two months later (December) the wine is drawn off the lees into other vats where it remains for two to four months, and is then measured and removed from the farmer’s adegas. delay and inconvenience, a heavy fine is imposed which the wine shipper has to pay if he has not been successful in contesting his case. This boat has just left Villa Nova loaded with empty casks and shows a line spread of canvas which, with a strong and favourable wind, carries it to the wine country in three or four days. showing large blending vats, and pipes stacked on the scantling in three tiers. This cask is being made from new Memel oaken staves, has just been taken out of the steaming press, and is having the iron hoop driven on to bring it into shape. It is then turned over on its other end and a strong iron hoop is forced on while the staves are still pliable, and the shape is complete in a few minutes. Fire is burned inside the cask to dry and harden the staves. The heads are put in by slackening the iron hoops a little and then re-tightening. A cooperage is attached to all the larger lodges. Blending Vats in a Douro Lodge. The wines are received from the farmers’ adegas, are blended in the large vats, and afterwards run off into lodge casks to be stored away before shipment. Loading Wine in the Farmer’s Adega. The wine is measured from the vats in the adega, and run into the cask which had already been placed on the cart. 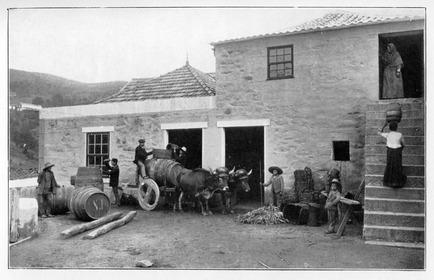 The wines are measured and taken out of farmers’ adegas in March, April and May of each year, and sent down to the shipper’s lodge. 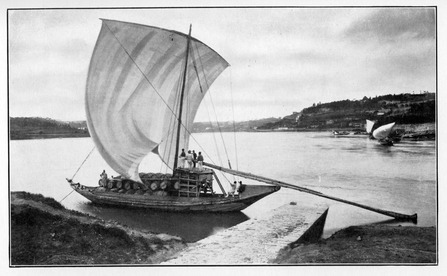 Carting is done by bullocks, which have to ford rivers in some parts of the country, and the roads to the best quintas are too narrow for any other kind of conveyance. Bullock Cart with Cask of Wine. Last edited by JacobH on 13:00 Thu 30 Jun 2011, edited 6 times in total. Could a kindly admin perhaps move these to the reference section - they are wonderful photos that have been beautifully scanned - thank you Jacob! Is anyone able to name the two quintas that are in the photographs? AHB wrote: Could a kindly admin perhaps move these to the reference section - they are wonderful photos that have been beautifully scanned - thank you Jacob! If the author is happy for this to be placed in the reference section I will move it. Historic Douro is a fabulous place. Can't be compared to the modern exterior. Are all the photos/some of them available at a higher resolution? I'm willing to place some of them to my personal collection. Last edited by indie05 on 07:45 Thu 26 Apr 2012, edited 1 time in total. indie05 wrote: Historic Douro is a fabulous place. Can't be compared to the modern exterior. Are all the photos/some of them available at a higher resolution? I'm willing to place some of them to my personal collection.